From September, subscribers to KDDI’s au network will be able to use a rebranded version of Gmail on both handsets and PCs. While Gmail can already be used on multiple platforms, the new service will be known as ‘au one mail’ and will come free of charge. 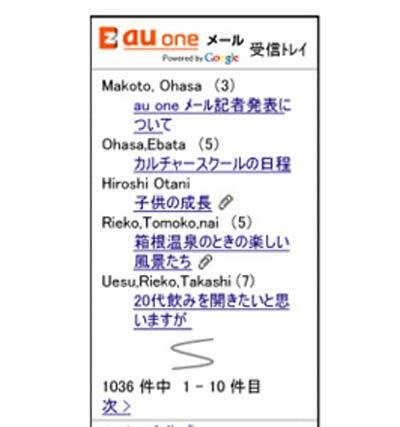 The Japanese-language interface shown by KDDI is similar to the normal Gmail look, with the only difference being an orange logo at the top of each screen. As the networks in Japan already allow users to access their mobile mail through a PC website, the value of the new deal is likely to be in the perceived value of the Google name to Japanese customers. Typical users are either unaware of the PC interface or prefer to use their phones anyway. The au network is the second largest in Japan, with almost 30 per cent of the market there. Google and au previously collaborated when the carrier started offering Google searches on its mobile homepage last summer.